Discover out-of-the-way places like Upper Falls of the Yellowstone River and Artists’ Paintpots. Escape the urban bustle at Dragon's Mouth Springs and Mesa Falls. Go for a jaunt from Yellowstone National Park to Gardiner to see River Rafting & Tubing about 1h 15 min away. On the 12th (Thu), dedicate a day to the elevated beauty of Mount Washburn. Spend the 1st (Sun) exploring nature at Fairy Falls. 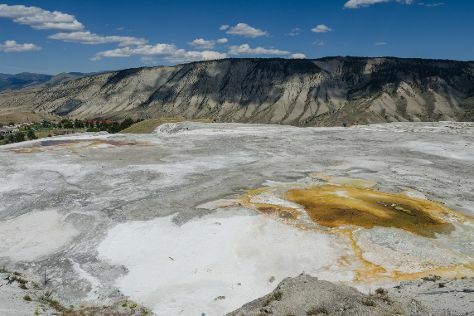 The adventure continues: take in the natural beauty of Upper Geyser Basin, take in the dramatic natural features at Biscuit Basin, take a memorable drive along Lamar Valley, and ponder the design of Fountain Paint Pot. For other places to visit, ratings, reviews, and more tourist information, use the Yellowstone National Park travel route builder app . In August in Yellowstone National Park, expect temperatures between 70°F during the day and 38°F at night. Wrap up your sightseeing on the 15th (Sun) early enough to travel back home.